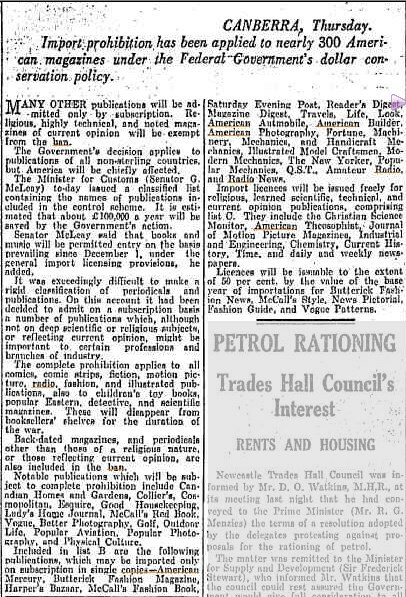 Most of Australia’s government and commercial broadcast radio stations were formed in the 1925 to 1934 years. 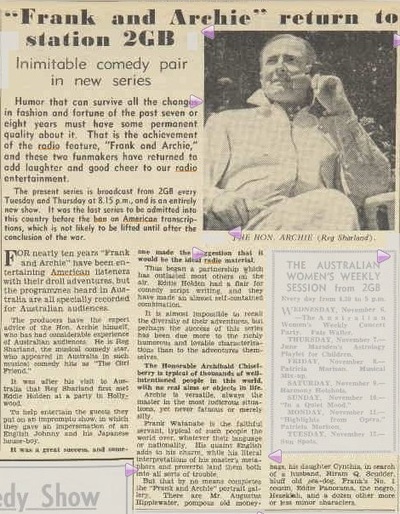 Program content usually consisted of the station announcer or presenter armed with a library of household gramophone records, and was at the time the programme provider for Australia’s broadcasting stations. The bigger stations then began providing dramas and musicals produced in their own studios and aired direct to their listeners – no others. Then networks were built, and through landline relays the feature shows reached wider audiences, through an ever growing number of stations. But for many reasons landline connection was not completely satisfactory. Landlines were scarce, expensive and technically inferior. Sponsors uncertain of whether their shows would even reach the audiences they aimed at were dissatisfied, and so were the smaller stations. They couldn’t afford to stage their own features, and if they didn’t happen to be in the area a national sponsor wanted to cover, they simply could not get that sponsor’s show. Still the station presenter, with his commercial discs held fort for those unlucky broadcasters. From as early as 1933, importation of recorded transcription discs from overseas (particularly USA) was a growing industry. Miss Grace Gibson selling recorded programs from the USA to station 2GB was a large factor in this. 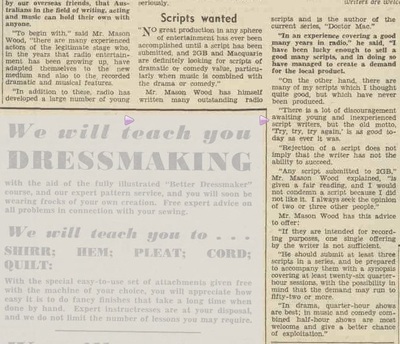 Then, in 1935, an industry that was destined to bring features to any station that wanted them, quickly, easily, without loss of quality, and cheaply, began to mushroom. Independent record companies began producing shows for the air, and selling them to stations and agencies. 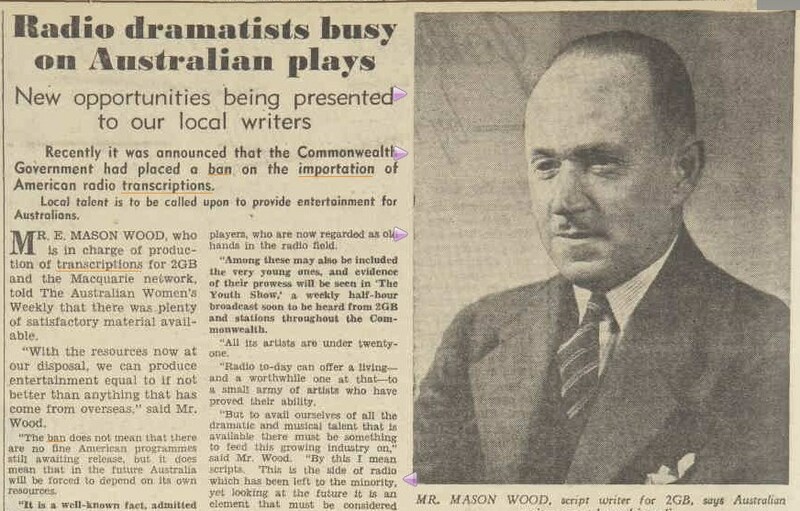 The agencies themselves went into production and in a few years top line shows – musicals, plays, and serials, plus the commercials to go with them – were being supplied to city and country broadcasters all over the Commonwealth, and were even being exported. 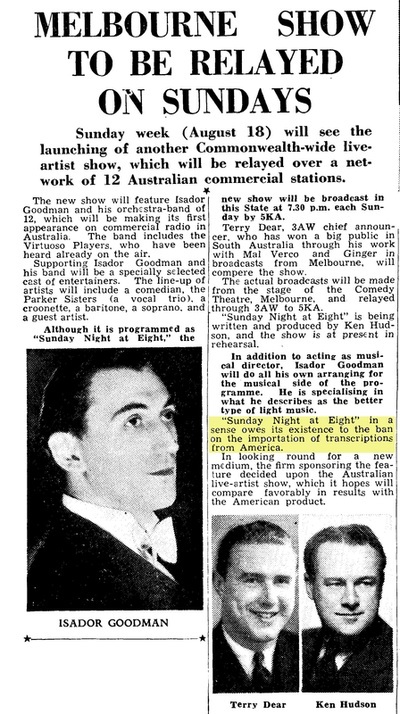 It was in 1935 that AWA, which became one of the largest companies in the Australian transcription industry, made its first record of a feature show for local airing. It was a 16” disc of “Fred and Maggie”, which had previously been aired as a live show, through 2CH. Following the airing of that disc, the company was so impressed with the possibilities of syndicated programs that it decided to plug that line of radio business as hard as it could. By 1951, AWA had cut more than 1500 episodes of Fred and Maggie, and its program recording totaled to over 2000 quarter-hours a year. Meanwhile in Melbourne, Featuradio announce that their first all Australian transcriptions, featuring two well known J. C. Williamson artists will shortly be on the air from station 2UW Sydney. The year…1935. This is to be a series consisting of a minimum of 156 five minute episodes, entitled “Emma and ‘Erbert”. Featuradio are incorporated in NSW in 1936 making electrical transcription discs and by 1937 have become ARC (Australian Record Company). Recording studios are shared with station 2GB at 29 Bligh St Sydney. By 1939 Artransa under the guidance of Miss Grace Gibson is incorporated as a separate company, owned by the new Macquarie network with 2GB as the key station. Grace Gibson went on to form her own Australian production company in 1944. 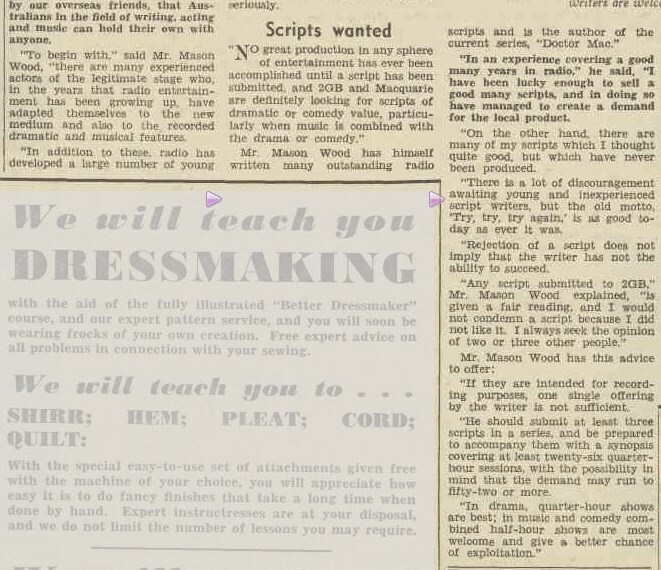 Also in the early days of the transcription industry, sponsors and their advertising agencies hired the recording facilities, for example, of the Columbia Gramophone-HMV organisation, then Electrical and Musical Industries (EMI). It is said – though this is unconfirmed – that Pepsodent was the first advertiser to record its sessions for distribution. From 1930 Columbia/EMI played around and put out experimental transcriptions, and over the next couple of years supplied radio stations with pre-recorded short features on 10” and 12” 78 & 33 1/3 rpm shellac discs. Presently EMI thought, why shouldn’t it make its own recordings – after all, the making and selling of recordings was its business. It teamed up with George Edwards and embarked on the production of transcriptions. The first of these, Darby and Joan, with George Edwards as Darby and Nell Stirling as Joan, was recorded on May 27, 1935. 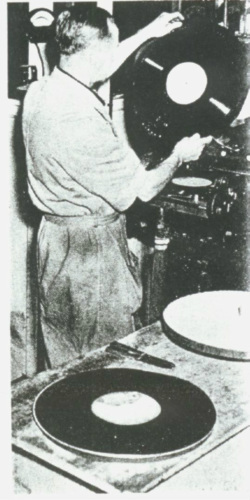 By 1951 this is an indication of the magnitude to which the transcription industry had grown – George Edwards, with Columbia records 30 quarter-hour shows a week – and that entails pressing 33,000 discs a year. Though perhaps the largest, EMI was but one of the 4 or 5 major record pressing companies of Australia, and was but one of the many more producers that make up the transcription industry. EMI did not produce exclusively George Edwards’s shows – the output of other producers is recorded for sale as HMV or EMI broadcasting transcriptions. Big supply of Good Imported Shows Still Available. The transcription industry in Australia has emerged from its infancy and is facing a virile future. An integral part of the broadcast system, it is destined to play a role of ever increasing importance in the field of advertising and in the field of entertainment. 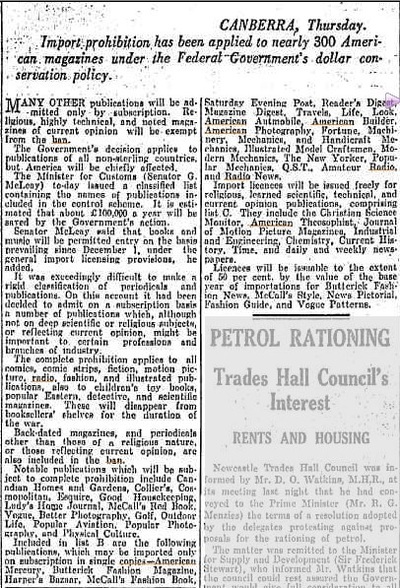 Makers of Australian transcriptions welcomed the Government ban (imposed in December last) upon further importation of foreign transcriptions from non sterling countries as a “heaven sent” opportunity to command a greater share of the Australian market. Nevertheless it must not be assumed that had the ban not been imposed Australian transcription making would have been left in the doldrums. Far from it. Many magnificent shows were committed to disc locally, and successfully sold in the face of very strong competition from imported disc shows long before the ban was imposed, thus indicating the ability of Australian producers to compete with the worlds best. The position now is that Australian producers will be called upon to supply a vastly increased demand through the lack of imports of new overseas shows on discs. Nevertheless there are still many good imported transcriptions available on the Australian market either for first or second release. A good show is capable of two or even three releases as has already been proved. The increased popularity with advertisers of daytime advertising over the air is all the time opening up fresh opportunities for second release of transcribed features. One refreshing aspect of the transcription import ban will be the greater use of some of the world's best scripts for local production on disc. Where we cannot buy the discs we may at least be able to secure the scripts. However, the bulk of the transcription business in the years to come (so long as present international conditions exist) will fall upon the shoulders of Australian producers and disc makers. It is generally agreed that we have the producers, we have the artists, we can produce the scripts, and we can manufacture the discs. On the strictly technical side there have been vast developments in the Australian transcription field in recent years and while no difficulty is foreseen at present in the securing of various types of equipment which is still necessary to import, there is no doubt that our skillful technicians could meet any eventuality in that sphere. From the moment Australia recorded and made electrical transcription discs for the broadcasting industry, exporting to the 4 corners of the globe has been continuous and highly successful. Sydney and Melbourne are the nation’s top two transcription centers. The shows are produced and recorded here chiefly because Australia’s artistic talent gravitates to the two largest cities. Of the two, Sydney is most productive. Indeed it has been termed “a young Hollywood”-of the air. The production of broadcasting programs has grown to a big, busy activity for Sydney. As the leading transcription center, it provides a large part of the program needs that are the life-blood of many Australian broadcasting stations. Transcription people say that overseas sales are important in making independent production a paying proposition. New Zealand was our best outside market for transcriptions. It is estimated that New Zealand bought 80 per cent of Australian-made programs that were available. South Africa was next in importance as a customer. A few shows reach British audiences through Radio Luxembourg, and a lot got to the USA. Our shows also went to Canada, Ceylon, Honolulu, Singapore, Malaya, Malta, Suva, the West Indies, Portuguese East Africa and Hong Kong. In some of these situations Australian shows reach the public by re-diffusion, though most are broadcast. In Hong Kong and the West Indies, re-diffusion is under local Government control, subject to central policy control by London. There the authorities regard the Australian programs, with the plugs that go with them as highly important. In Barbados, for example, American tourists may hear the Australian Hit Parade produced by AWA, at the same time as it is heard in country towns here. With the end of the 2nd World War looming and the severe curtailment of imported transcription discs still in force, the local transcription industry is full steam ahead. From the mid 1940’s in Melbourne, Broadcast Exchange Library have absorbed Legionnaire and Televox productions and emerged as Broadcast Exchange Australia (BEA), Donovan Joyce has commenced production, so too has Hector and Dorothy Crawford (Crawford Productions) and Australasian Radio Productions (ARP) under the hand of Moris West. Discs are pressed in Melbourne by White and Gillespie Record Processing P/L (W&G Records). 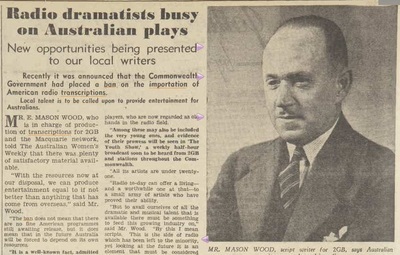 AWA also sets up shop in Melbourne recording radio serials using local talent. In Sydney from the mid 1940’s onwards the main producers are, EMI, AWA, ARC, Macquarie/Artransa, Grace Gibson, Ron R Beck, Fidelity just to name a few. Some landmark dates are to be noted; 1951/52 saw most recording production go from inside start disc to outside start. Late 1950’s saw the introduction of microgroove transcription discs in 10” and 12” sizes and the phasing out of the 16” format. The last vinyl transcription disc for broadcasting use was pressed by CBS Records (formerly ARC) in mid 1978 is a Grace Gibson 12” disc, “Crisis Point”. From then on all new recordings were available on reel to reel tape and the upcoming new CD format. Some 45rpm advertising discs continue being pressed for a couple of years, soon to be replaced too by tape.